Who doesn't love a soft, fluffy kitten? Unfortunately, all that fur provides great hiding places for fleas. While infested adult cats are treated with flea powders and sprays, such harsh medications can be harmful to kittens. There are several home remedies that will eliminate a flea epidemic. Bathing a kitten can wash away fleas, but a bath may not get rid of microscopic eggs or larvae. This is a significant problem because for every adult flea, there are an estimated 200 eggs. The best way to bathe a kitten is to use a soft, liquid soap like dishwashing soap or baby shampoo. Most of these soaps will kill flea eggs and larvae readily. Run a bath as if for a baby (making sure the water is lukewarm), then massage the soap into the fur all over the kitten, making sure to get every area covered by fur but being careful not to soak the eyes or ears. PIck off any fleas that escape to the head area. When finished, rinse the kitten by submerging him up to the neck in water and then towel dry. Be sure to turn off any air conditioners or fans, as the kitten will need to be warm while he dries. Flea combs are effective at removing fleas and are recommended for ill-tempered kittens who do not bathe well. While these combs are good at removing fleas on their own, it is recommended that they be used in conjunction with a bath in order to kill the larval fleas which the flea comb might not reach. If a kitten’s mother has fleas and the kitten is still nursing, the kitten also will be infested. Treat the mother with a product safe for nursing cats. 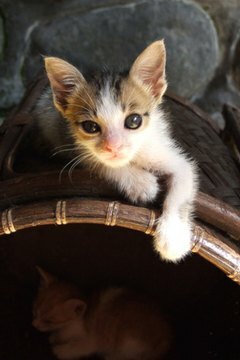 If the cat is no longer nursing, or the kitten is now in a home with other adult cats, use conventional flea treatments found in pet supply stores. Another way to minimize your kitten’s exposure to fleas is to treat the house and yard. For the home, there are flea-preventive carpet powders. Outside, contact a pest company that offers service plans for flea control -- making sure to let them know there is a kitten on the property, in case the chemicals are too harsh -- or pick up an over-the-counter spray designed specifically for outdoors. These sprays usually provide an adequate amount of control without being too harsh for kittens, but read the product label to be sure.